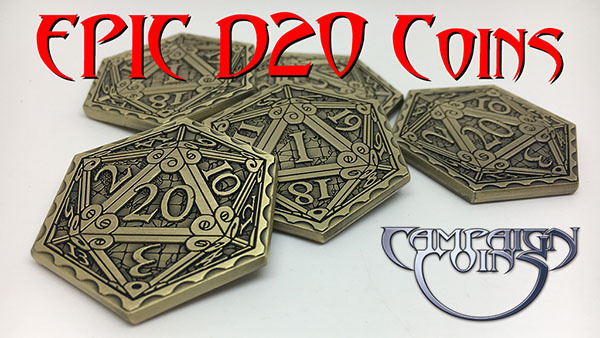 Our Epic D20 Coins are now available, thanks to the heroic 810 Kickstarter backers who made them possible. These are beautiful, hefty and detailed versions of our much loved D20 design by Lynda Mills. They are available in Antique Copper, Silver or Gold. They are great to use in any D20 roleplaying game session as re-roll tokens. Our backers seem to universally love them, and we think you might too. For those of you familiar with our original D20 Coins, here is a size comparison for the new Epic D20 coins!